It's all about taking down Vivian Volkoff on the season finale of Chuck. Read on for a full recap. "Chuck Versus the Last Details"
Chuck and Sarah race to save Momma Bartowski in time for their wedding. Meanwhile, Morgan faces Vivian while Ellie sets up the rehearsal dinner. Chuck invites the Buy More crew to go camping with him for his bachelor party; Ellie makes a life-changing discovery while investigating her father's laptop. "Chuck Versus the Wedding Planner"
When Chuck and Sarah's wedding funds are stolen, they turn to the one con man that can help them - Sarah's father. "Chuck Versus the Family Volkoff"
Timothy Dalton returns to Chuck this week. Can he be trusted? Chuck will find out. Chuck is placed in charge of a vital mission this week. However, his leadership ability is pushed to its limit following a murder. Are Chuck and Sarah being phased out? They wonder about this possibility after a new mission starts operating from Castle. "Chuck Versus the First Bank of Evil"
Ray Wise guest stars on this episode of Chuck. It focuses on wedding planning and on Chuck trying to get Vivian in touch with her inner villain. Lauren Cohan shows up on this installment of Chuck. It focuses on a masquerade ball in England. "Chuck Versus the Cat Squad"
Lou Diamond Phillips guest stars on Chuck this week. Meanwhile, Chuck has a surprise for Sarah: the return of The C.A.T. Squad! "Chuck Versus the Seduction Impossible"
We're on to a new chapter in the lore of Chuck. During this episode, Chuck and Sarah are set to Morocco to rescue Roan Montgomery. 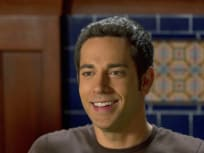 "Chuck Versus the Push Mix"
Sarah try attempts to free Mama Bartowski on "Chuck Versus the Push Mix," while Morgan and Chuck team up against Volkoff. Also, Devon grows anxious. Sarah must save Mama Bartowski on "Chuck Versus the Gobbler." Elsewhere, Ellie and Awesome get into it over the name of their baby. Chuck goes on assignment to a French vineyard this week. There, he must track down a chip AND try to set up a proposal for Sarah. Chuck is in for an awkward family reunion the day after Thanksgiving: mom brings Volkoff over for dinner. Meanwhile, Morgan must deal with Black Friday at Buy More. Sarah, Chuck, Morgan and Casey immerse themselves in the jungles of Southeast Asia this week in order to escape The Belgian. Meanwhile, Ellie and Awesome delve into the world of Steven Bartowski. 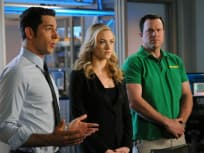 "Chuck Versus The Fear of Death"
Chuck tries to impress this week by going on a dangerous mission, while Casey and Morgan protect Jeff and Lester from the truth when the latter pair snoops around to determine Greta's identity. "Chuck Versus the First Fight"
Timothy Dalton guest stars on this installment of Chuck. The episode centers around Chuck and his rogue mission, as he sets out to avoid Sarah following the couple's fight. 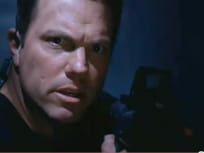 "Chuck Versus The Aisle of Terror"
The mission this week? Prevent Dr. Stanley Wheelright from releasing a toxin that causes nightmares. This task continues to make Chuck question which side his mon is on, while, elsewhere, Jeff and Lester make Halloween plans for Buy More. 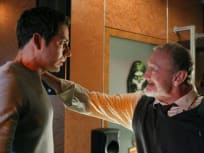 "Chuck Versus the Couch Lock"
Casey's former team comes back looking for him this week, as Chuck must choose what he's willing to sacrifice in order to find his mother. Meanwhile, Morgan considers whether to reveal a dangerous secret to Casey. "Chuck Versus the Coup D'Etat"
A trio of Casey's old friends have gone rogue. They play a major role on this edition of our favorite NBC show. "Chuck Versus the Cubic Z"
Stone Cold Steve Austin and Nicole Richie both appear on this episode of Chuck. Read on for a detailed review. It's undercover time for Chuck and Sarah on this episode. They head to Milan in order to find a secret weapon. 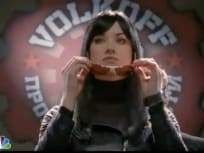 Olivia Munn appears on the season four premiere of Chuck. She guest stars as Greta, as we catch fans up here on what the latest Buy More happenings. This is not the opening of a tv show. This is real life. Permalink: This is not the opening of a tv show. This is real life. I can't believe this was under your house. This is nuts. A secret spy base and it's got lasers and gadgets...and neatly organized files. Chuck Season Finale Round Table: "Chuck Versus the Cliffhanger"
Chuck Round Table: "Chuck Versus the Last Details"